My recent reading of fellow staffers' pick The Little Book Store of Big Stone Gap by Wendy Welch reminded me of this, my favorite Pat Conroy novel. In her memoir Welch lamented the loss of her appreciation for fiction after the pursuit of her doctorate, an affliction professed by many pursuing scholars. 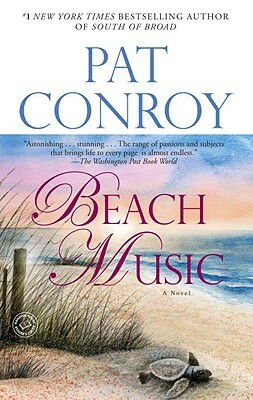 Beach Music is the title that returned her love of fiction. It was my first Pat Conroy novel and remains my favorite. I have read all his fiction to date, but this is the one that haunts me 20 years later. I have often opined that Conroy's writing has excised most of his demons and his work might suffer from good cheer. Unfortunately, Mr. Conroy has been dealt a new challenge. A Southerner living abroad, Jack McCall is scarred by tragedy and betrayal. His desperate desire to find peace after his wife’s suicide draws him into a painful, intimate search for the one haunting secret in his family’s past that can heal his anguished heart. Spanning three generations and two continents, from the contemporary ruins of the American South to the ancient ruins of Rome, from the unutterable horrors of the Holocaust to the lingering trauma of Vietnam, Beach Music sings with life’s pain and glory. It is a novel of lyric intensity and searing truth, another masterpiece among Pat Conroy’s legendary and beloved novels.